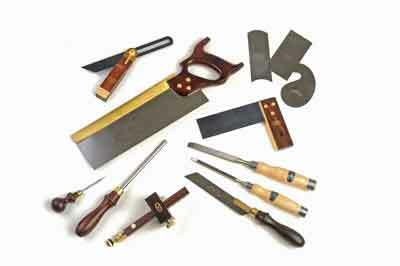 Crown Hand Tools is well known for carving and turning tools, but as shown here, they have plenty of other hand tools to offer woodworkers. Their range is extensive and it isn't possible to list or show all the good quality tools they produce, so we have chosen a selection, which cover the typical needs of a bench woodworker. This tenon saw is their largest model suitable for a range of tasks with 13 teeth per inch. It has a heavy brass back to stiffen it and allow the saw to cut without undue pressure. This is one of a range of beech (Fagus sylvatica), rosewood (Dalbergia retusa) and brass mitre and try squares. It comes with a nicely blued steel blade, brass facing and brass pins to lock the blade to the body, which has a smooth lacquer finish. This model has a marking pin on one face and screw adjustable mortise pins on the other. The head has inset brass strips for accuracy and a milled brass knob to lock it. This set covers all the standard requirements for scraping wood smooth and there is just enough flex in the steel to perform correctly. You can't use a scraper without a burnisher and this one comes with a 150mm long, thick high speed steel rod, which is perfectly smooth and is ideal for achieving a nice even burr on a scraper blade. This flexible blade saw cuts on the pull stroke. With 20tpi and no set to the teeth, it is intended for fine trimming work without damaging the surrounding surface. This lever type is easy to use and the rosewood stock is nicely finished with brass plates inset at the bottom. The blued steel blade is long enough for most purposes but Crown also make longer 229mm and 267mm blade versions. A scratch awl is an excellent way to set out lines or mark dovetails because it can get into tight corners and leaves a clean line that is very visible. Crown also make a longer version with a 127mm blade. These chisels are in metric equivalents running from 6mm to 51mm blade widths. They all come with a thick square section blade, lacquered ash (Fraxinus excelsior) handle, which is leather washered to the blade, which helps to reduce shock. There is also a steel ferrule and striking hoop on the top end. 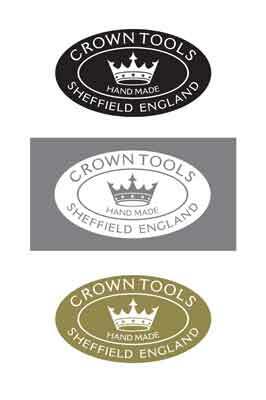 These tools are perfect if you want to work with and appreciate good quality traditional Sheffield hand tools. The full range is vast and there is certainly something for everyone to choose from. You can see the full range by visiting their website.